I love phone call tracking simply because it gives me a break from the regular tracking I do through Google Analytics and other similar tools. If you have been in the field of digital marketing as long as me (more than a decade), you tend to get bit bored, looking at the same metrics over and over again. This is not really the case with phone call tracking as it comes with a whole new set of its own metrics and a cool reporting interface where you get the chance to optimize an entirely different marketing channel called ‘Phone call’. Just like ‘organic search’, ‘paid search’ and ‘social media’, a phone call is a marketing channel. You may already know that but you need to consciously remember the fact, that when you are talking about phone calls, you are in fact talking about an entirely different marketing channel. Once you start treating phone calls as a marketing channel, you look into investing in it as a marketing channel. You optimize it for conversions, just like any other channel and phone calls become an important part of your multi channel funnel analysis. A phone call conversion can be a sale or a lead resulted from a call. The percentage of phone calls which resulted in a conversion is called the Phone Call conversion rate. In the world of phone calls conversion optimization, the user experience that we optimize is the ‘phone call experience’. An outstanding phone call experience matters a lot. If your customers are not having absolutely wonderful experience from the very first phone call and are not simply blown away by your service and help, then you are more likely to lose sales/lead to your competitor. Imagine you are in a business of selling and installing swimming pools (very high priced products). Now people do not directly buy swimming pools online. They may browse your website to see the type and price of swimming pools you provide. But they almost always have tons of questions which need to be answered over phone before they can make purchase decision. Now imagine a person made a call to your business to enquire about a swimming pool and was first put on a hold for few minutes and was later handled by a rude and incompetent sales agent who knows very little about the pools you sell. ‘Call opening’ is the first impression and first impression is very important as it often set the scene for the remainder of the call. Yet many business do not really understand and appreciate the importance of ‘call opening’ esp. those who believe in greeting their callers with automated calls (pre-recorded marketing messages). If you wish to improve your phone call conversion rate then you have to improve the phone call experience of your callers. By listening to the conversations between callers and your sales staff, you can determine why the calls did not result in sales and what can be done next time to improve the call experience. Every phone call is a live customer feedback to you. If you listen carefully and make notes along the way, you can hear customer objections. Once you have a list of common customer objections, then look for ways to remove such objections by training your customer support staff. This will improve your phone call conversion rate. If your website has been set up mainly to generate leads through phone calls then a phone call is a very important touchpoint in your users conversion path. A touchpoint is that exposure to a marketing channel through which a person comes in contact with your brand. A person can come in contact with your brand before, during and after completing a conversion on your website. By identifying the touch points which occurred before and during a conversion, you can understand your customer’s journey to purchase. Whereas by identifying the touch points which occurred after a conversion has taken place, you can understand your customer’s satisfaction level. For lead generating websites and for websites which sell very high priced items (like properties, automobiles, industrial machinery etc), a phone call is an extremely important touchpoint. When you treat phone calls as touchpoints, they become an integral part of your multi channel funnel analysis. If your website has been set up mainly to generate leads through phone calls then you have to attribute phone calls to the correct traffic source. Understanding exactly which marketing channels and keywords are driving phone calls is invaluable. Attributing phone calls to the correct marketing channels / keywords means you can increase the budget of the marketing channels / keywords which drive phone calls and reduce the budget of those that do not. If phone calls are an important part of your lead/sales generation process then phone call tracking is one of the most effective methods to fix your online and offline attribution issues. Google Analytics cannot track phone calls on its own. It also cannot provide detailed reports on phone call data. However in Google Adwords you can track phone calls and other calls details (like call duration, call start time, call end time etc) by using the Google forwarding phone numbers. You can track calls made on your website by embedding the free Google forwarding phone number on your website. You can also use Google forwarding phone numbers to track calls made directly from your Google Adwords ads. Through conversion tracking in Adwords you can determine how many phone calls you are getting from each of your ads. Conversion tracking can also be used to track clicks on the Google forwarding phone numbers which are embedded on the mobile version of your website. Whenever an ad click lead to a phone call made to your business, Phone Call conversions are recorded in Adwords. However it is not possible to import the phone call conversion data from Adwords into Google Analytics. Because of this reason, you can not correlate this phone call data with website usage data (pageviews, sessions, location, landing page etc) in Google Analytics and optimize your marketing campaigns. 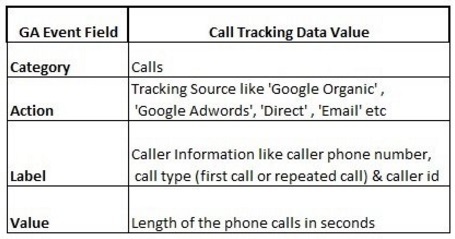 Moreover the phone call tracking in Google Adwords, report on only those phone calls which resulted from an Adwords ad. It can not report on phone calls generated from other traffic sources (like organic search, Facebook, referral traffic, direct traffic etc). So the call tracking solution provided by Google is not adequate for understanding the online marketing channels which are driving phone calls and for correlating the phone call data with website usage data. Some optimizers built their own in-house solutions for tracking phone calls in Google Analytics. But it has its own limitations. They are almost, always buggy, require life long maintenance and provide very basic functionality. They usually do not integrate with your CRM and other third party services thus creating data integration issues. Above all they are never going to be as robust as commercial phone call tracking solutions. Use such solution only when you do not do multi channel marketing and/or tracking phone calls is not very important for you. As the name suggest, these are ready made phone call tracking solutions. ‘ Call tracking metrics’, ‘infinity cloud’, ‘call rail’, ‘dialog tech’ etc are examples of popular commercial phone call tracking solutions. #1 You can attribute phone calls to the ‘correct’ traffic source. #2 You can import phone call data into Google Analytics. #3 You can import phone call data as lead into your CRM. 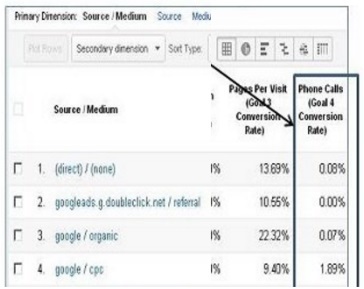 #4 You can correlate phone call data with website usage data to optimize marketing campaigns. #5 You can evaluate the quality of phone calls leads by tracking low quality (calls which did not result in sales) and high quality phone calls (calls which resulted in sales). #7 You can create ROI dashboard which shows phone calls ROI for each marketing channel. #8 You can improve you phone call conversion rate by listening to the conversations between callers and your customer service representatives (CSR) and determine why the calls did not result in sales and what can be done to improve the customer’s phone call experience. Thus commercial phone call tracking solutions play a very important role in fixing multi-device and multi-channel attribution issues and in accurately tracking sales data, across devices and platforms. CRMs like Hubspot and Salesforce. Your call tracking software should ideally integrate with both your Google Analytics and CRM accounts. For example, ‘Call Tracking Metrics’ integrate both with Google Analytics and Salesforce. Once your call tracking software integrates with your GA account, you can import phone call data into Google Analytics. Once you have imported the call data into GA, you can then correlate the call data with your website usage metrics (sessions, page views, traffic sources, traffic medium etc.). This way you can use phone call data to optimize your online marketing campaigns. A user visit your website and see your phone number. The user calls your phone number. As soon as the call is placed, your call tracking script: records the source of the phone call, the actual phone call conversation, phone call duration etc. Once the call is over, the call tracking script send the phone call data to your phone call tracking software. Your phone call tracking software send some (and not all) of the phone call data to your Google Analytics account as either events or virtual pageviews. Step-1: Choose your phone call tracking service provider and sign up for their service. I like and use ‘Call Tracking Metrics’. I have used many call tracking solutions but this one seem to be the best fit, for my needs. You need to buy at least one tracking number per traffic source in order to track phone calls from that source. If you do not do this then you will not be able to track phone calls from a particular traffic source. For example, if you do not buy a tracking number for ‘Google organic search’ then you will not be able to track phone calls coming from organic search traffic. Similarly, if you do not buy a tracking number for ‘Google Paid search’ then you will not be able to track phone calls coming from Google Adwords traffic. The more tracking numbers you buy, the more you can segment the data. For example, if you buy one unique tracking number for each display ad, you can then track the performance of each display ad individually, in terms of generating phone call leads/sales. Step-3: Set receiving number for each tracking number. When you set up a new tracking number in your call tracking software, you would need to set the corresponding receiving number. The receiving number is the phone number to which calls will be forwarded to, from the tracking number. The receiving number is usually your phone number. Step-4: Prominently display phone numbers on your website. Remove other call to actions (CTA) around the numbers in order to increase the probability of getting more phone calls. Run A/B test to determine the best location for displaying a phone number on a web page. Step-5: Copy and paste the call tracking script provided by your call tracking vendor on your website pages. This action will integrate call tracking software with your website. Step-6: Link your call tracking account to your Google Analytics and CRM accounts. For more details, refer to the help documentation from your service provider or contact the customer support. Step-7: Add your call centre staff as ‘users’ to your call tracking software and train them to make notes and score each phone call. This is the most important step of setting up phone call tracking. Your call tracking reports will be of little value if your call centre staff are not scoring each and every phone call. Scoring a phone call means giving it a star rating and assigning it a sales amount, if it results in sales. 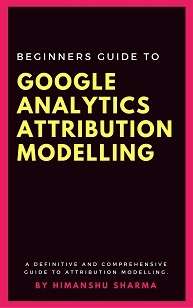 Ask your call tracking vendor, how do they send phone call data to Google Analytics. 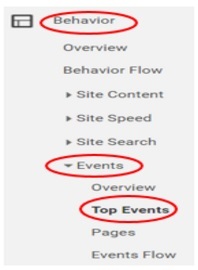 Some vendors send call data as ‘events’, while others send call data as ‘virtual pageviews’ to GA. If your call tracking software sends call data via events (and it should be doing that) then ask your vendor exactly how the call data is structured as GA events. 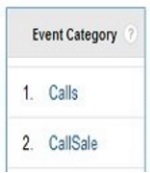 ‘Event Category’ field called ‘Calls’ is used to report on the phone call data. 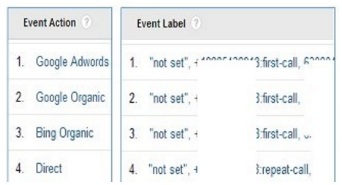 ‘Event Action’ field is used to report on phone call tracking source (like Google organic search). ‘Event Value’ field is used to report on the length of a phone call in seconds. ‘Call tracking metrics’ uses second ‘event category’ called ‘Call Sale’ to report on the phone calls sales data . Ask your vendor how they report on phone call sales data. Once you have set up phone calls as goals in GA, they will become available in all GA reports which have got the ‘goal’s tab. For detailed phone call analysis in GA, you can create custom reports. Custom reports provide much more flexibility in terms of retrieving and reporting on phone call data. Through custom reports you can easily retrieve phone call goal volume (in addition to phone call conversion rate) for each traffic source. This is something which is not available in standard reports. 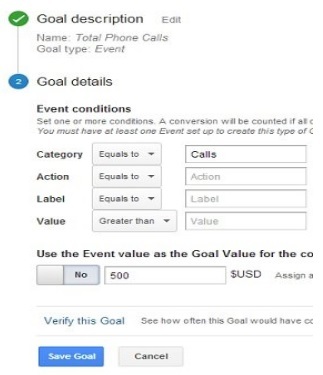 If your Google Analytics is receiving phone call data as ‘events’ then create goals of type ‘event’ in your GA view. In the screenshot above, a phone call is worth $500 for my client business. That is why I have added $500 as goal value. You can determine what a phone call is worth to you by calculating the average value of a phone call. Average Phone Call Value = total revenue generated through phone calls in a month/ total number of phone calls in a month. Note: You may need to add a new phone call value each month, to keep seasonality into account. Once your call tracking software integrates with your CRM, you can import phone call data as leads into your CRM software. You can then later retrieve these phone leads (along with qualified leads, won leads and the monetary value attached with each phone lead) from your CRM into Google Analytics. As soon as the call is placed, your phone call tracking software send call data (along with client ID or user ID) as a lead to your CRM, in addition to sending phone call data to its own software. You later retrieve the phone leads data from your CRM into Google Analytics. Thus by integrating your call tracking software with your CRM & GA, you can track qualified and won phone leads (along with their monetary values) in Google Analytics. You use a CRM software like salesforce. Your CRM provides ‘web to lead‘ functionality. The ‘web to lead’ function generates a special code which you add to the code of your website lead generation form. This code sends the lead data from your website directly to your CRM software on form submission. Your CRM integrates with your call tracking software. Step-1: Set up phone call tracking on your website. Step-2: Integrate your phone call tracking software with your CRM. So as soon as the call is made, call tracking solution assigns user’s website usage data to the call and send phone call data (as a lead) along with the client ID value to your CRM software. Step-3: Depending upon the number of GA metrics you want to send to your CRM, create one or more corresponding custom fields in your CRM. For example, create one custom field in your CRM for storing the client ID. Step-4: Download data from your CRM once a week and prepare it for import into Google Analytics. Step-5: Import the CRM data to GA. You can import the data to GA via ‘data import’ feature or measurement protocol. Note: If you are brand new to the ‘data import’ feature, then read this article: How to correctly measure conversion date and time in Google Analytics where I have explained data import feature in great detail. Add a special tracking number (purchased from your call tracking solution provider) to your billboard ads. So whenever someone call that number, you would know that the lead has come from billboard advertising. If you are using billboards ads in different cities, then buy and use one tracking number for each city. In this way you can segment the outdoor phone leads by location. Buy one tracking number for each location you are planning to advertise at. More tracking numbers you buy and use, more accurate your reporting will be. If you are advertising your business in a newspaper or magazine, you can add a special tracking number (purchased from your call tracking solution provider) to your print ads. So whenever someone call that number, you would know that the lead has come from newspaper /magazine ad. Buy at least one tracking number for each different print medium. Buy one tracking number for each different print ad copy. In this way you can segment the print media phone leads by ad copy. If you are advertising your business on taxis, buses, trains, tubes or plane then buy and use at least one tracking number for each transit medium. So whenever someone call that number, you would know that the lead has come from taxi advertising or bus advertising. Here also the process is the same. Buy and use separate tracking numbers for each unique radio and tv ads.